In the realm of horror pictures you need something to grab the audiences eye. A really cover picture on the cover of your DVD and or a cool name. This film actually has both. 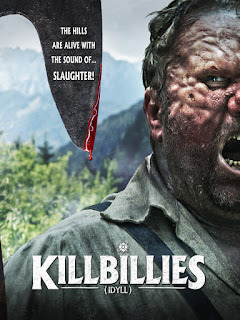 Presented by Artsploitation Films, Killbillies has an ear catching name and an eye popping cover featuring a big nasty deformed hillbilly holding a giant blade. Just looking at this made me know I was in for a treat, and seeing as how I was home sick anyway I threw it right on and was treated to a great time. Better yet I was going to watch the first horror film to come out of Slovania. It’s the story of a group of very annoying models. We first meet them in an overly long opening sequence in a bar where we get to see that they are not the type of girls to be messed with after one has an altercation with a drunk pervert in the bathroom. Cut to the next morning and there off to the county for a photo shoot. In a scene really out of nowhere they stop when they see a weird kid playing an accordion siting with a woman. The models stop and ask if they can buy some booze from them?!! Anyway they set up there equipment and right away you get the feeling that they are being watched. Turns out they are, by the Killbillies. 2 grotesque looking large men who run down to the shoot, because its on their land. They grab the cameraman and the girls and when we next see them they are locked up in a giant shed. It’s there that the Killbillies begin there killing. Smashing ones head to a bloody pulp on a wall, knives to the throat, axes, you name it. It all leads to the inevitable climax in the woods after some of the women make an escape. The film is fun. However I must state is a foreign release so you will have to read the subtitles. Don’t worry though its not overly complicated Quinten Tarentino dialogue your reading here. With that said it plays out like a grand throw back to 80’s shot to video films. Don’t get me wrong it does not look cheap, in fact some of the practical effect are really well done. But it has that look and feel of and old school horror film that I love. The claustrophobic scenes when the models are captured to the frantic paced scenes in the woods. I really enjoyed the cinematography as it kind of that’s you back to those old 35mm Drive-In Movie days. The acting was very well done as well. The Killbillies come off as creepy and nasty as they need to too and the girls all play their parts to perfection. The pictures looks really good despite being a dvd. I would go as far as to say it looks better than a few Blu-rays I have seen lately. The sound is perfect and the subtitles pop out perfectly. That is a big mark of respect for me as so many films have washed out sub titles, or they use the wrong color so you miss some of the words on outside scenes. Not here. They are presented dead in the center with breaks between characters and all. The Killbillies look great, deformed perverted mangled up hillbilly killing machines match that with the fact they are going after attractive models and you have a definite winner on your hands here. I would recommend picking this one up.